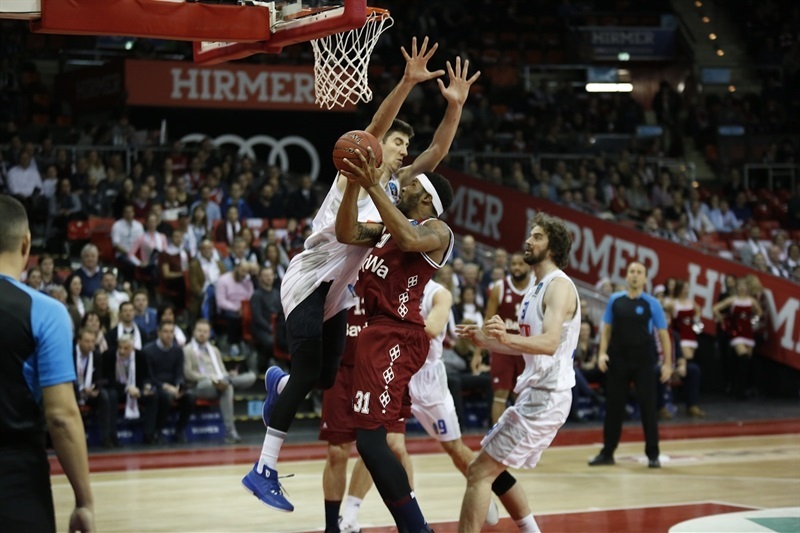 First place FC Bayern Munich kept its unbeaten record alive by holding off a resilient and stubborn Buducnost VOLI Podgorica 85-82 at home on Tuesday night. 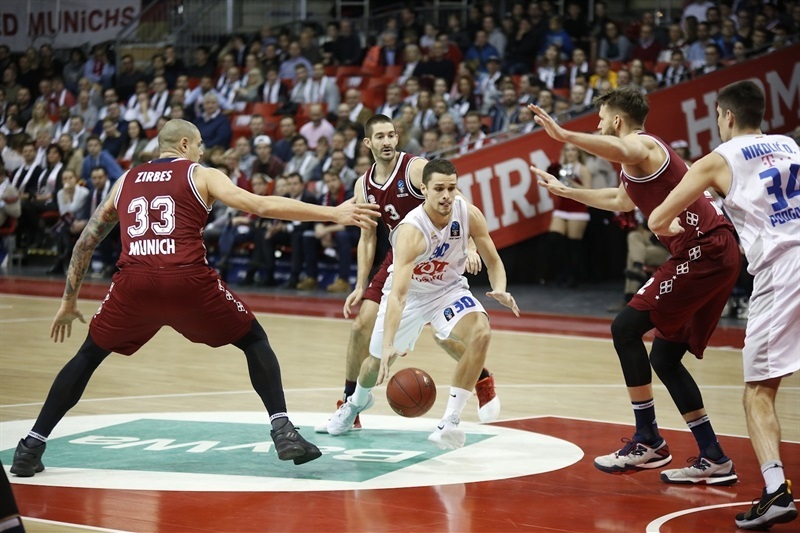 Bayern improved to 9-0 in Group B, while Buducnost dropped to 4-5, but can still qualify for the Top 16 as early as Wednesday if Hapoel Bank Yahav Jerusalem beats Grissing bon Reggio Emilia on Wednesday. Bayern never trailed after the first quarter, but Buducnost never went away despite committing 21 turnovers. 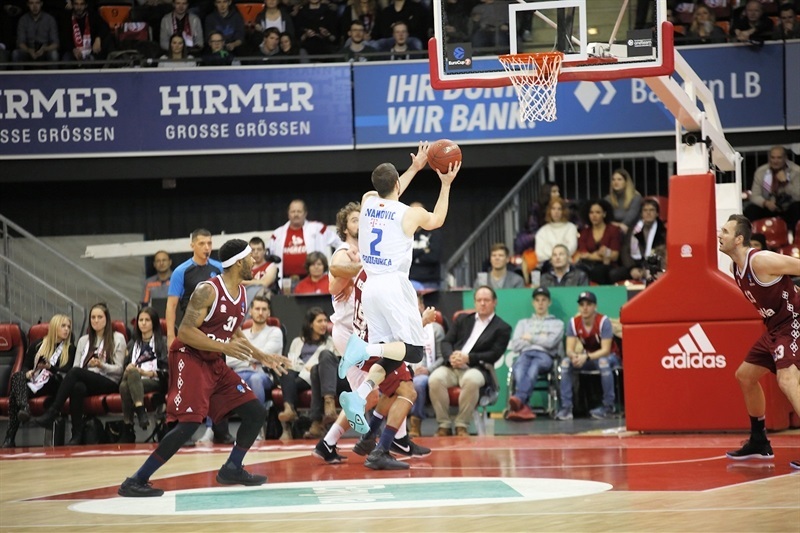 The visitors did hit 13 triples and Nemanja Gordic was on fire in the fourth quarter, but Bayern stepped it up defensively in the final five minutes and secured the win. The hosts had five scorers in double digits, with Devin Booker and Jared Cunningham scoring 15 apiece. Nihad Djedovic added 13, Milan Macvan 11 and Braydon Hobbs finished with 10 in victory. 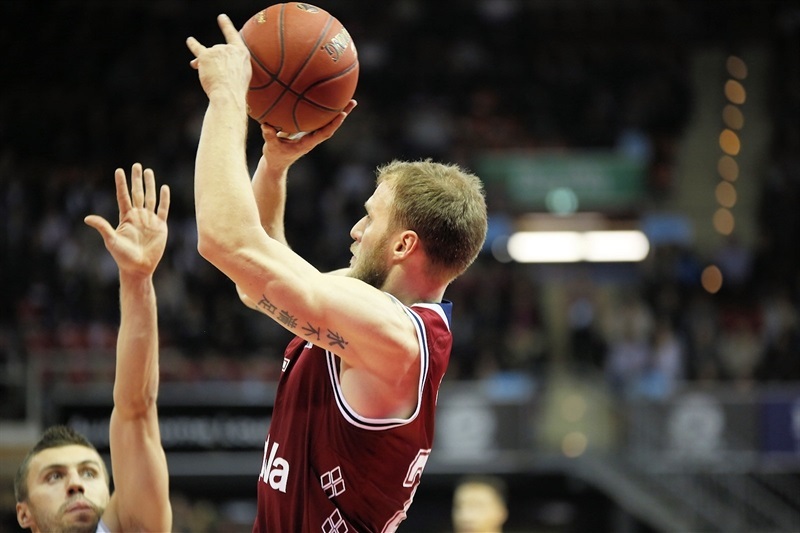 Nikola Ivanovic had a career-high 27 points and 6 rebounds for Buducnost, while Nemanja Gordic at one point strung together 16 consecutive fourth-quarter points for Buducnost and finished with 22 points, 7 assists and 4 rebounds. Kyle Landry collected 10 points and 9 rebounds in defeat. Both teams rained triples early. 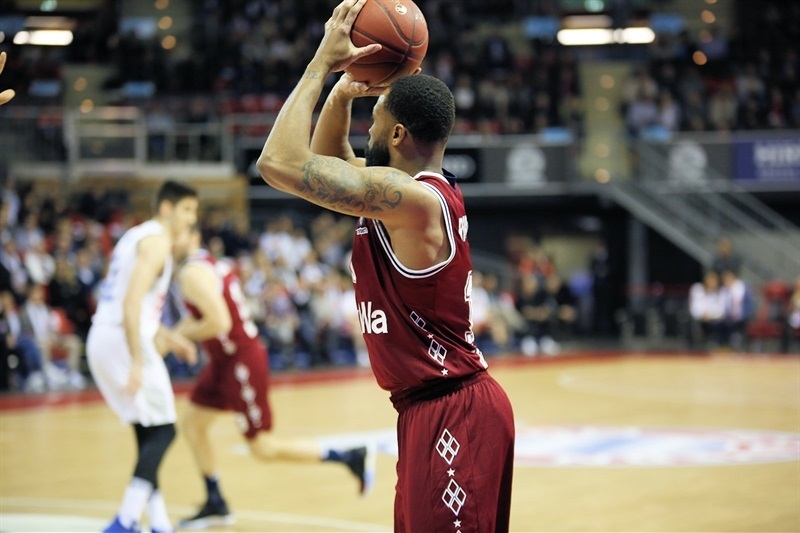 Reggie Redding and Landry traded threes, before Anton Gavel and Milic Starovlah did the same. Starovlah’s second three-pointer put the visitors up 9-11, but Cunningham answered with one of his own from downtown on the ensuing possession. 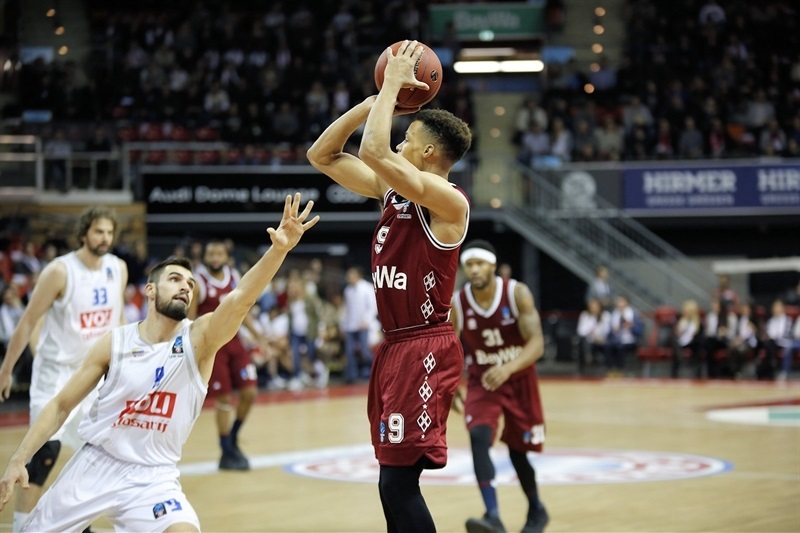 Djedovic’s fastbreak layup made it 17-13 and after a series of free throws on both ends, Djedovic beat the first-quarter buzzer with a shot from his own three-point line that made it 24-17. Baskets were few and far between in the second quarter, but Booker had 4 points that helped Bayern open a 29-19 cushion. Ivanovic nailed a pair of triples for the visitors that cut it to 31-25. Macvan had a pair of baskets and Djedovic hit a three that put the hosts up 42-33, but Sead Sehovic had a layup and Ivanovic a step-back triple that closed the gap to 3. Macvan beat the halftime buzzer with a layup for a 43-38 advantage. Landry’s layup and Kyle Gibson’s triple cut it to 45-43, but Cunnigham and Booker gave Bayern some breathing room. Landry hit a three-pointer and the teams traded buckets. Cunnigham had a three-point play and Djedovic made a steal and a layup that made it 60-52, but Ivanovic nailed a three to keep Buducnost within reach. 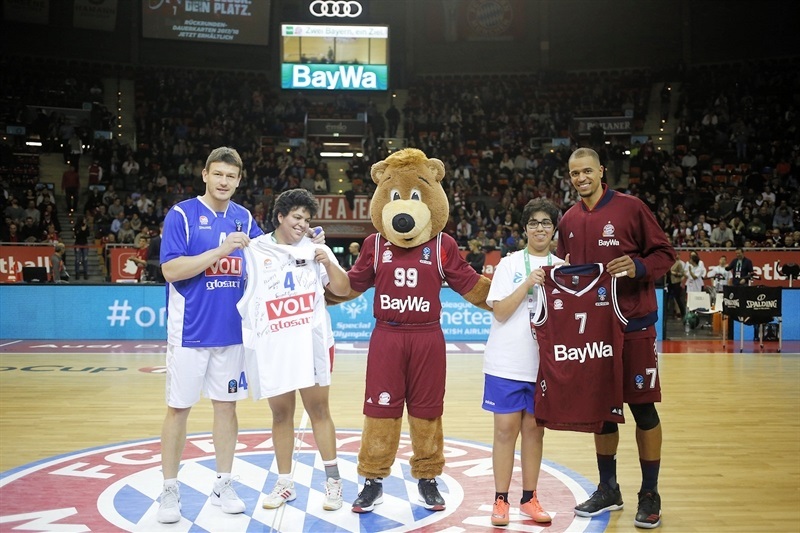 However, a second-chance layup from Barthel and a three-pointer from Hobbs helped Bayern to 67-57 after three quarters. 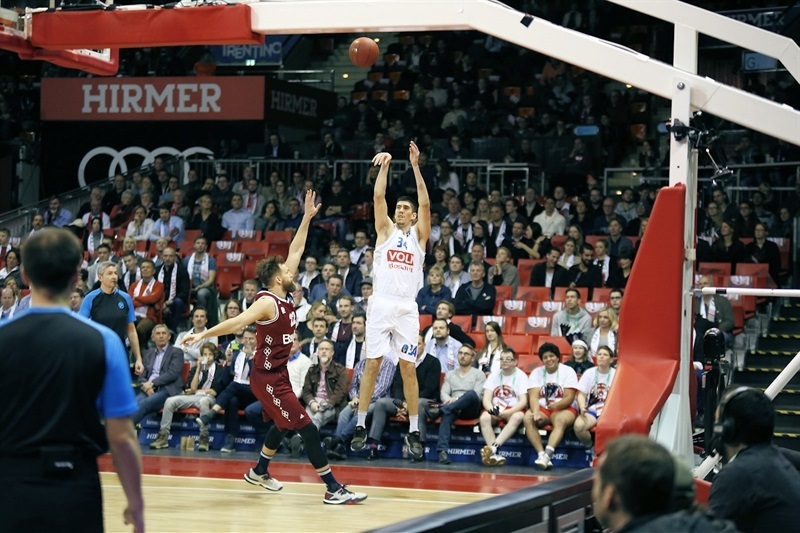 Ivanovic scored a fastbreak basket and a corner triple to open the fourth quarter, but a three-point play by Hobbs and a baseline drive from Djedovic put Bayern at 74-65. But Gordic replied with back-to-back threes, and a minute later, his third consecutive triple tied it at 74-74 with just over five minutes to go. However, Bayern allowed only one basket in the next three minutes as Macvan and Booker put Bayern ahead with 5 of 6 free throws. 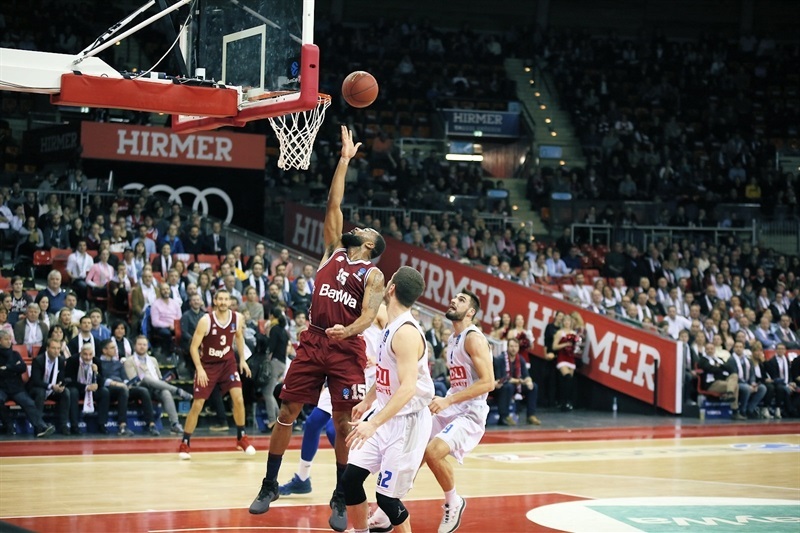 Gordic hit a runner, his 16th consecutive point for the visitors, but Cunningham blocked Landry’s potential game-tying triple with 22 seconds to go before Hobbs sealed the win from the free throw line.〈/p〉〈p〉In Round 10 Bayern travels to face Grissin Bon Reggio Emilia, while Buducnost hosts Lietkabelis Panevezys. "We had seven games in the last 18 days and you can real feel that in the legs of our players. We responded with a character, but the energy was not there. We could not break the game a couple of time, they were always coming back with long threes, they shot the ball really well. They had 34 three-point attempts, which is not common in basketball today. We had to work hard to defend against that. That’s a typical team from the ex-Yugoslavian way of basketball, with a lot of creations from their guards, good defense, and good game-planning by Coach Dzikic. They had two days more to prepare this game. All these games we accumulated, players felt it, not just physical but the mental effort, as well. We have to use this game to see some of the mistakes we might be repeating. It is important to win even if you don’t play good. We don’t want to lose games; this is the most positive thing out of this game." 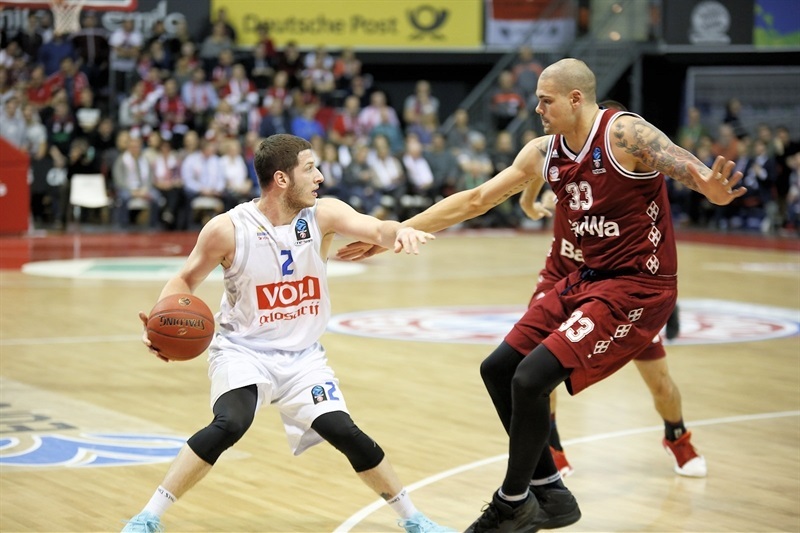 "Bayern is one of the three best teams in the EuroCup, and what they have, that’s easily EuroLeague level. We tried, and I think we put up a good fight. 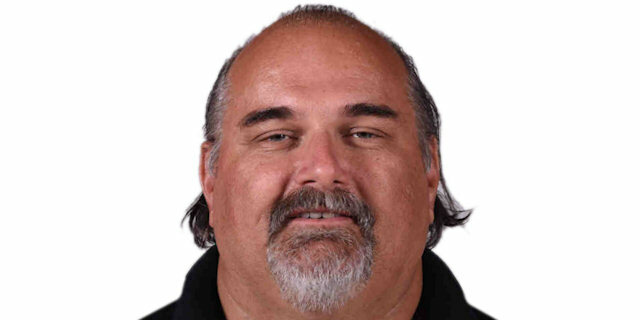 So, it was a good experience for some of our guys."